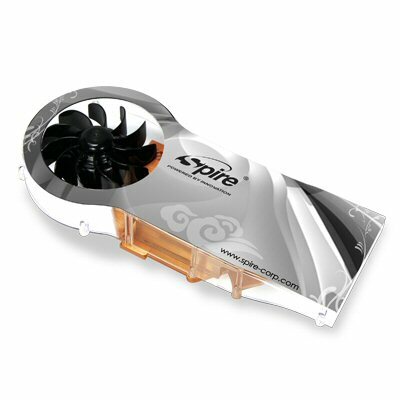 Give your high performance video card a break from extreme temperatures with the all new SilverBlaze Video Graphics Array Cooler from Spire. This one-of-a-kind GPU cooler does not only look awesome but is also an extreme performance product. Featuring a 2000RPM Sleeve bearing 80mm, 11 Blades DC fan, with ample airflow of 28.0CFM this cooler will keep your video-card performing at its best! The specially designed mounting clip-mechanism makes this cooler easy to instal and a perfect solution for your Nvidia based video cards. * Mounts on virtually any Nvidia performance video-card on the market today!